Well it’s Father’s season and I sincerely hope that all you dads out there are reading this while playing a well deserved 18, or else heading straight to the 19th. Today, I won’t be hawking a gift guide or a list of tired dad-isms that have worn out “listicles” and social media over the years (dad-bod, dad-strength, etc. etc. etc.) Instead, I say we take a moment to pause, tip our hats, and raise our beers to a great man who is, in a way, a father to us all. In fact, I think it’s no coincidence that he has a birthday this weekend. 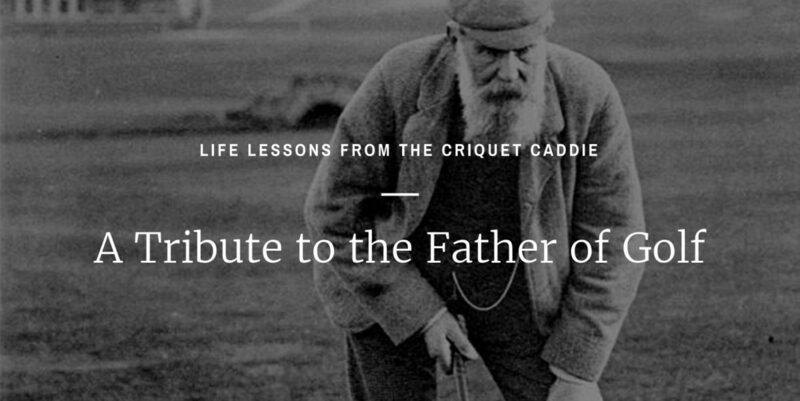 Old Tom Morris, folks. Gentleman, OG Cool Dad, and Groundskeeper Extraordinaire. He would have been 197 this weekend, and you better believe he’d still be getting in cuts if he were alive today. The old Scotsman’s legend precedes him. Just look at the numbers— he designed 75 courses, Played in 36 British Opens (4 of which he ended up winning), and in 1862 he claimed the W by a scintillating 13 strokes—a record not to be equalled until Tiger came around. Local lore says that as a part of his daily morning routine, Old Tom used to walk to the shore and swim around in the North Sea, just to loosen up. EVERY DAY. That’s Jan-Dec in Scotland. Crazy, yet impressive…as all dads are. Aside from fathering the great game of golf—both the bane of our collective existence and our most treasured “happy place”—the man was a pretty great dad to an actual son as well. Young Tom Morris was no deadbeat living-off-his-father’s-fame son, staying in the basement all day drinking Mountain Dew and playing Skyrim. No, Young Tom took a page right out of his epic father’s book, and his victory at the Open Championship (when he was just 17) still remains a record. He went on to win 4 championships by the time he was 21. That being said, let’s not steal the fire from all the other dads out there. Most of us have our own legends to tell about our fathers. The same ones that fully deserve that Criquet Shirt you so wisely gifted them this year. But when we talk about stewards, role models, and people who talked-the-talk and walked-the-walk, Tom deserves a little homage. Ultimately, we’re lucky that Old Tom lived the way he did and that he approached both his craft and his beard with such dignity. If it weren’t for him, the game as we know it might not exist. So in honor of him, we raise a glass (of single malt) to the Scottish Walt Whitman.